Ever wish you could have a robot maid like Rosie in the Jetsons? If you have solar panels installed on your home, the truth may not be that far off. In fact, a lot of major utility-scale power plants are opting for automated solar panel cleaners that are powered remotely and complete with artificial intelligence. While this tech is largely available only in beta tests—and for large, commercial arrays—it’s definitely an indicator of what’s to come, both in the world of solar and in homes in general. If you’re wondering how bots will influence solar, you’ve come to the right place. Read on to learn more about this evolving and highly-futuristic technology. Curious whether cleaning your solar panels makes any difference in their efficiency? The answer is a little more complicated than you’d think. Experts in the solar industry and the scientific community remain divided over the issue—not about whether or not it negatively affects productivity (spoiler alert: it does), but whether that small dip in production is enough to even matter. On one hand, there are some installers that feel an occasional cleaning absolutely impacts the panel’s ability to efficiently convert sunlight to energy. After all, you wouldn’t go around with a dirty windshield, the thinking goes. On the other side of the issue are those who admit that dirty panels lower efficiency—but don’t think that drop in production is enough to warrant paying for a cleaning. For instance, researchers at the Jacobs School of Engineering at UC San Diego looked at a range of small-scale solar arrays, and determined that lightly soiled panels only lowered efficiency by 0.05 percent per day—a value that was worth about $8 a month. In their opinion, that value wasn’t worth the price of cleaning, which usually costs between $60 to $80. That being said, their research only looked at lightly-soiled panels. If you live in a region with heavy particulate matter in the air—like an agricultural area—or if you regularly experience dust storms or leaf drop, cleaning your panels could be to your benefit. And cleaning is obviously getting a whole lot more scientific. Let’s take a look at how new tech is changing the process. In desert locations across the globe, building managers and homeowners alike love solar panels—understandably, since there’s no shortage of sunlight there. But these areas also get more than their fair share of dust. For instance, The Ketura Solar plant, located near the Israel-Jordan border, sees regular sandstorms—and not much rain to wash away dust and debris. That’s why this facility opted to install a robotic solar cleaning system that can clear over 100 square feet of panel surface area per minute. Their system, designed by solar cleaning startup Ecoppia, features a waterless solution that blows dust and grit off the surface. The robots have wheels that let them glide over panels, and they’re controlled using a remote cloud so there’s no need for an operator to climb up on the roof. The Israeli launch was so successful that plants in India are starting to use them, too. 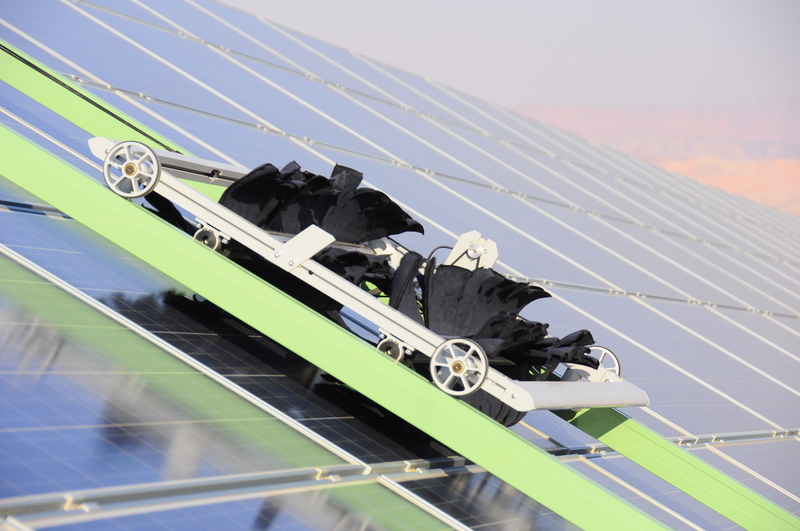 In a similar move, a Japanese company named Miraikikai has also been testing a branch of water-free solar cleaning robots, this time complete with sensors that guide it around the panel surface. Their solution should be commercially available sometime in 2017. And then there are the robots from Sunpower, a large US solar provider who’s been working to streamline large-scale panel construction and maintenance. Their new system uses drones to build solar arrays, and a fleet of robotic cleaners to keep panels shining like new after they go up. The cleaners aren’t waterless, but Sunpower says it uses 75 percent less liquid than a manual clean—and that it’s ten times faster, too. The new “Oasis” plants using this technology are being constructed now in the US and China. Your average homeowner probably doesn’t have that much use for a high-end cleaning system like one of those, especially in more mild climates. Still, it’s cool to see where solar technology is going. Changes like this point to a more efficient, high-tech brand of solar energy to come in the future. Some predictions? Self-cleaning solar panels might be one, particularly if the price of solar continues to go down. It will be exciting to see what else scientists come up with in the next few years. There’s never been a more energizing time for solar, and we can’t wait to see what else comes down the pike. Robot cleaners that help you generate energy to power your home? Jetsons, eat your heart out!